Today is San Jacinto Day! We, along with many others across the state, turn our thoughts to the final battle of the Texas Revolution that took place on April 21, 1836. The victory paved the way for a new government to form under the 1836 Constitution of the Republic of Texas and the rest is legal research. 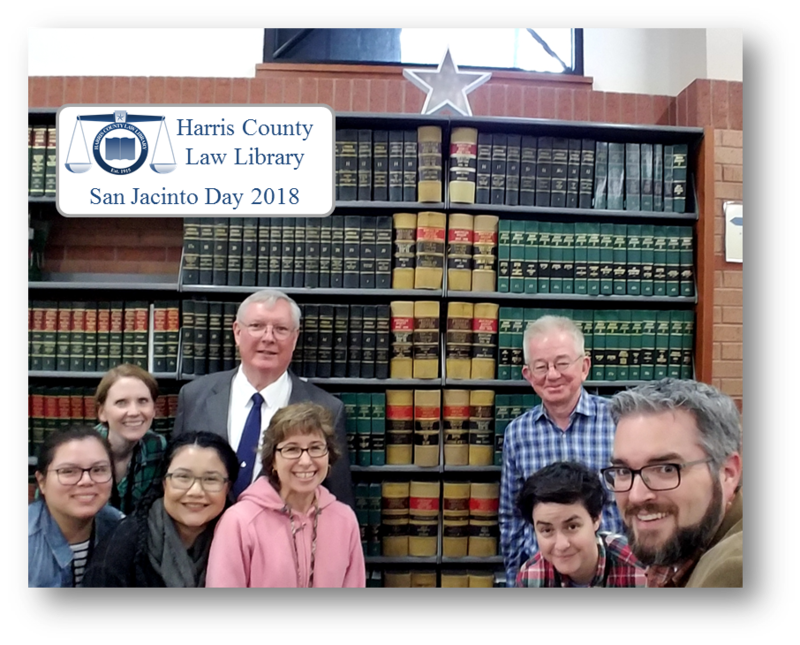 To celebrate the day, we're offering a #shelfie opportunity the week of April 23 at the Harris County Law Library. Grab your phone and take a #shelfie in front of our monographic replica of the San Jacinto Monument. Be sure to post it to Twitter and tag it #SanJacintheStacks! The fight against violence and bigotry is of perennial concern in American Jurisprudence. Ten Dollars to Hate by Patricia Bernstein brings the story of one such fight from the 1920s into our modern consciousness. The book tells the story of Texas prosecutor Dan Moody, whose efforts against the Ku Klux Klan led to the nation's first successful prosecution of the well-connected group for their violent assaults and criminal acts. Moody's lead was followed around the country, loosening the supremacist group's grip on American politics. Ms. Bernstein will present her research alongside a panel of attorneys who fight hate and bias everyday at a free CLE event on September 8. The event is cosponsored by the Offices of Vince Ryan, Harris County Attorney, and Kim Ogg, Harris County District Attorney, and is accredited for both CLE (3.0 hours in Texas; 0.5 hour ethics) and TCOLE credit. Register today at www.harriscountylawlibrary.org/tendollars. Happy San Jacinto Day, Texas! Happy San Jacinto Day, Texas! Today marks the 181st anniversary of the final battle for Texas independence that took place in modern day Harris County between the forces of General Sam Houston and General Antonio Lopez de Santa Ana. The victory left a lasting impression locally and even inspires the centerpiece of the seal of the Harris County Attorney's Office. For more on the battle and how it influenced the design of the Law Library's parent organization's seal, see our Ex Libris Juris post commemorating the 180th San Jacinto Day. Throughout its history, Texas has had its share of larger-than-life figures from outlaws Bonnie & Clyde to war hero Audie Murphy to R & B superstar Beyoncé. Perhaps, one of the more colorful characters to arrive and take up residence in the Lone Star State was Judge Roy Bean, who died on this day in 1903. As we celebrate Texas History Month, let’s take a look back at the life of one of the more interesting and picturesque figures in American jurisprudence. Born in Kentucky, Judge Roy Bean found himself in Texas after encountering some trouble (of his own making) in both Mexico and California. He opened a saloon, The Jersey Lilly, as an homage to the beautiful actress Lillie Langtry with whom he was quite smitten, and founded the village of Langtry, described as “a one-street frontier town nestl[ed] in a deep canyon of the Rio Grande where the railroad crosses the big river.” (See Orange Daily Tribune 5/29/1903). It was in this saloon, that Judge Bean, the self-proclaimed “law West of the Pecos,” meted out his own version of justice in the Old West based upon his notions of fairness and the law. No one is quite certain as to how he became vested with the authority of a justice of the peace, but nevertheless, he held court while seated “on the billiard table with a copy of the statutes of 1879 (the only one in his possession).” (See The Southern Mercury 6/30/1904). (To see a copy of the Laws of Texas, visit the Law Library). Of course, it's not surprising that his decisions were always final with no room for an appeal. Judge Roy Bean is best remembered for his peculiar rulings that really did seem, in retrospect, to smack of common sense. In one case, two men came to the court with their wives and expressed a desire to be divorced, adding that they wished to marry the other man’s wife. The judge granted the requested divorces and then proceeded to marry each man to the other’s wife. (See The Sunday Gazetteer 9/14/1902). In one of his most noted cases, Judge Bean held an inquest over the remains of a man found under the bridge that crossed the Pecos River. In the man’s pockets, the judge found a revolver and $50. The judge then fined the corpse $50 for carrying a concealed weapon. This ruling may still be the only one on record where a dead man was fined for carrying a concealed weapon. (See The Southern Mercury 6/30/1904). The judge was also known for handing out punishments whereby the offender was required to pay his fine by purchasing beer, typically two dozen bottles, at The Jersey Lilly and treating the crowd. (See Orange Daily Tribune 5/29/1903). Perhaps, not the most ethical of punishments, but it is certainly one of the most memorable and popular with the townsfolk. The exploits and rulings of Judge Roy Bean have been documented in newspapers throughout the State of Texas. If you are interested in learning more about the judge and reading some articles about him, visit The Portal to Texas History, a wonderful website maintained by the University of North Texas Libraries that features some rare and historical primary source materials. Also visit the site of the Texas State Historical Association and The Handbook of Texas, a digital gateway to all things Texas. If pop culture is more to your liking, sit down and watch The Life and Times of Judge Roy Bean, a 1972 film starring Paul Newman as the judge and Ava Gardner as Lilly Langtry, the object of his affection. There was also a short-lived television series, Judge Roy Bean, that ran for one season from 1956-57, and a French film, entitled Le Juge, which was released in 1971. 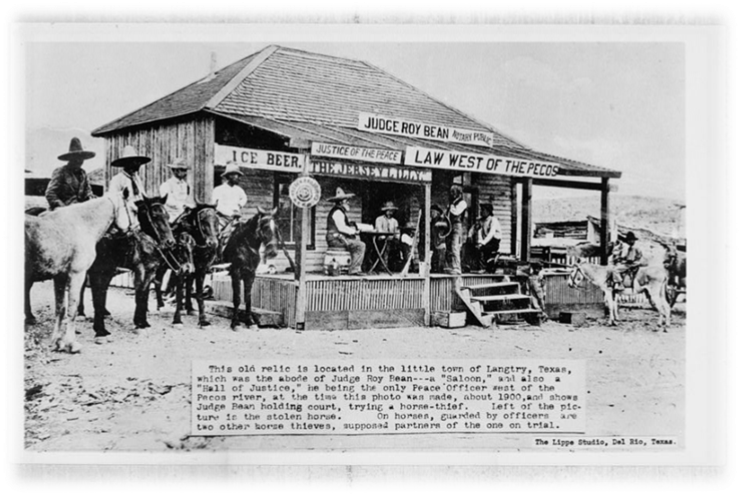 For good or for bad, Judge Roy Bean has certainly carved himself a place in Texas history. As for the question of whether he is a leading figure in American jurisprudence, you be the judge. On this day in 1845, Texas became the 28th state of the United States of America. Texan voters supported annexation as early as 1836, but opposition in the U.S. was strong. After years of heavy debate, Texas finally achieved statehood. The Harris County Law Library has been recognizing this important date all month long with an exhibit in the Law Library lobby. A new exhibit will take its place at the start of the new year, but many of the featured items can be viewed online, including sections from Unites States Statutes at Large that document the annexation, as well as an 1844 broadside of the annexation debate, a political cartoon depicting the marriage of Texas and the United States, and an early Texas map. For more information about the events leading up to annexation and eventual statehood, please visit the Texas Almanac online. Texas became a state on December 29, 1845. The Harris County Law Library is recognizing this anniversary with an exhibit, Texas Achieves Statehood. The exhibit will be on display through the end of this month. Visit the Law Library’s lobby to view the display. It features sections from Unites States Statutes at Large that document the annexation, along with an 1844 broadside of the annexation debate, a political cartoon depicting the marriage of Texas and the United States, and an early Texas map. To satisfy your taste for more Texas history, you can also visit the Library of Congress website. Here, you can view a collection of panoramic, historical maps from cities throughout the United States, including many cities in Texas. Happy 101st, Harris County Law Library! Today, the Harris County Law Library celebrates the 101st anniversary of its grand opening on October 1, 1915. 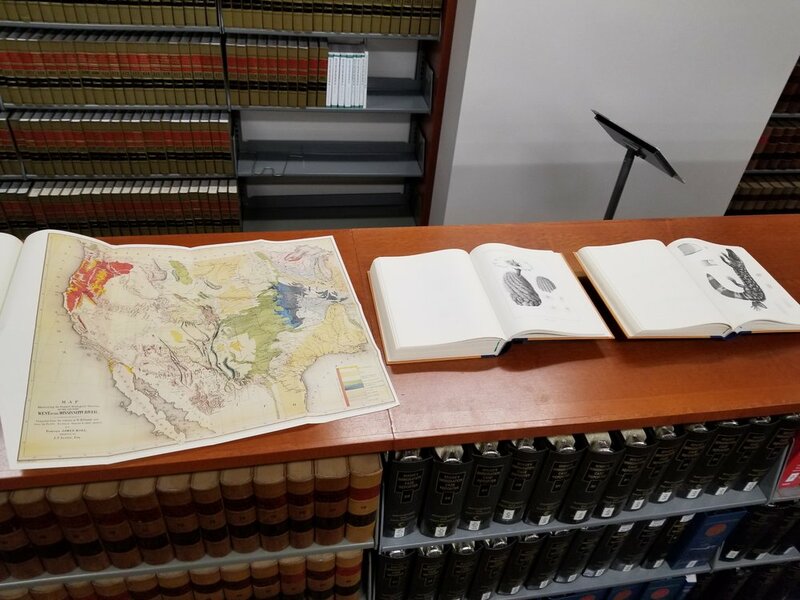 Although plenty has changed over the last century, one thing hasn't - the Law Library is still committed to providing patrons with access to relevant, current, accurate, and practical legal information. With free access to legal research databases, including Westlaw, Lexis Advance, Texas State Bar Practice Manuals, and more, the Law Library continues its commitment as a 21st century institution. Visit our downtown Houston location to learn more about all we have to offer. You can also discover more about the Law Library's Century of Service through our digital exhibit. Last year, we marked the milestone with a Centennial Celebration featuring keynote speaker Chief Justice Nathan Hecht of the Supreme Court of Texas. Videos of the speakers and information about our historic institution are available on our website.